Those with a web development degree work at a variety of locations, including marketing agencies, government agencies, or doing independent contract work. Common jobs you can get hired for in web development include webmasters, web designers, and computer and information systems managers. If you are interested in studying web development, read on to learn about what types of degrees you can earn and what types of jobs you can qualify for. You will also learn about alternative, non-degree programs, such as bootcamps, that you can enroll in to learn the required skills at a faster rate. An Associate’s Degree in Web Development provides you with the basics of developing, administering, and supporting websites and internet applications. You’ll learn HTML and other key programming languages. Some classes may include Introduction to Programming, Database Design and Implementation, and Web Database Integration. 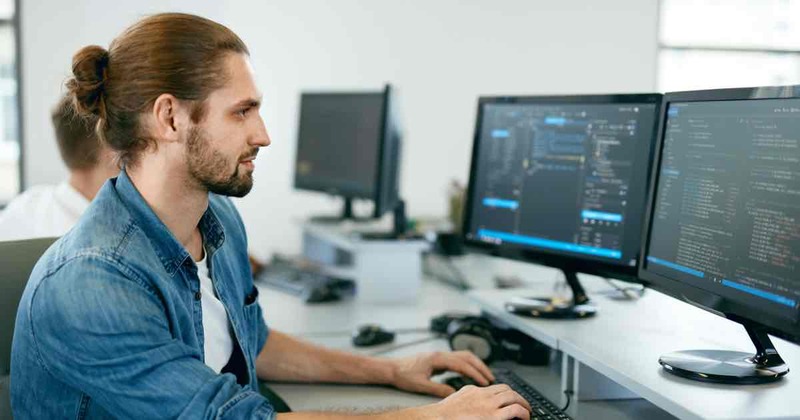 A Bachelor’s Degree in Web Development prepares you to for a more specialized position, such as a back-end web developer. You’ll explore in regards to programming languages and web applications as well as topics such as advertising, graphic design, and e-commerce to better serve clients. Some classes may include Management Information Systems, Web App Development, Mobile Applications and Frameworks for iOS and Android, and a Web and Mobile Development Capstone project. A Master’s Degree in Web Development teaches you more in-depth knowledge on web development topics, such as information architecture, web design, UX principles and programming languages. You’ll also gain more insight into services from the client side as well as the server side. Some classes may include Marketing Analytics, Digital Content Creation, Python Programming, and Principles of Project Management. Google Developers Training offers training on how to develop and launch your own Android app as well as other app developments. The program offers customized courses for both experienced developers and new programmers. Training includes tutorials and materials for self-study, along with online courses. At the end, you will take an exam to earn your Google Developers Certification. Web Development Tutorials, such as on Lynda.com, provide you with a library on individual classes you can take related to web and app development. Some classes may include Web Programming Foundations, HTTP Essential Training, and Building an App with React.js or Meteor JS. You may wonder if employers take alternative certifications like coding bootcamps seriously. According to one survey by Indeed.com of 1,000 human resources managers, 72% of employers consider bootcamp graduates to be just as prepared as similar degree holders, while 12% think they are more prepared and more likely to do better. The job outlook for web developers is bright with a projected growth of 15% from 2016 to 2026. Contributing to this growth is the rapid increase in online purchasing and mobile device usage, both of which need web developers to create sites and apps. In addition to strong web development skills, it’s also wise to have skills in other similar areas as well, such as in photo and video editing software, writing and editing, and more. These additional skills will make you more marketable to employers. Not only is there a variety of careers you can obtain, but you can also work in almost any industry. Nearly all businesses need a functioning website and mobile apps to attract and retain customers.